Until three and a half years ago, when her ITP diagnosis and low platelet counts introduced a new path to her journey, Katie was a competitive gymnast. Gymnastics was introduced in ancient Spain as a form of military training used to prepare soldiers for warfare. Gymnasts develop physical mastery of balance, strength, flexibility, agility, endurance and control and transcend mental skills including alertness, precision, self-confidence and self-discipline. Fascinating…in one instant, a young girl armed with a skillset imperative for survival on a battlefield is given no choice but to abandon her passion and step off the floor mat into the World of ITP. With such an exclusive skillset already in place, one would assume the transition from gymnast to ITP Warrior to be straightforward. Uncomplicated you ask? As any ITP Warrior can confidently affirm, absolutely not! Katie however, has certainly characterized it effortlessly. Once she overcame the anguish and discontent with her diagnosis, this ITP Warrior employed her skillset and took control of her ITP. 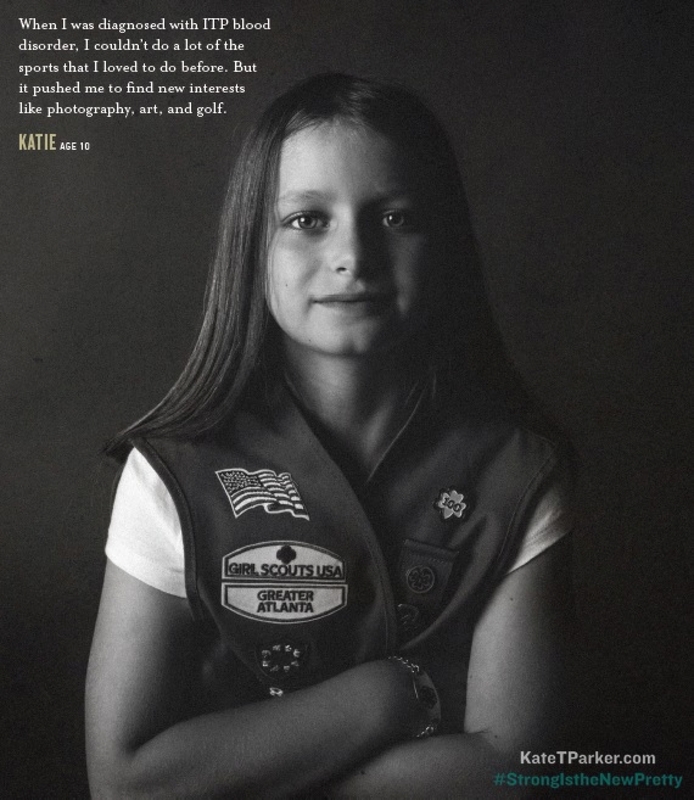 Active in scouting, Katie served as Miss Media for the greater Atlanta Girl Scouts – an “opportunity for girls to explore the evolving media environment, have hands-on experience developing communication skills, and engage in career exploration” and was selected to participate in a photoshoot with Kate T. Parker, photographer and author of the new book “Strong is the New Pretty.” Katie was there as a Girl Scout (not as an ITP patient) along with other young girls that were athletes, cancer patients, amputees and others living with arduous diseases. As she spoke with Kate T. Parker about her interests, something inspiring emerged. This young girl, who had her passion stolen by low platelet counts, surprisingly began to speak about her ITP. “When I was diagnosed with ITP blood disorder, I couldn’t do a lot of the sports I loved to do before. But it pushed me to find new interests like photography, art and golf,” Katie told the author as they chatted. Katie described to Parker her journey with ITP and how she used what she initially viewed as a setback as a means to explore new horizons. Inspired by the courage of the young ITP Warrior, Parker selected Katie’s quote about her ITP to depict Katie’s portrait shot in the book. Yet another warrior in the growing all-star lineup of champions raising awareness, advocating strength, and fighting the battle against ITP. You’re awesome Katie - stay bold, strong, beautiful…and BEAT ITP!